I have always had a love for 3D modeling. I assembled my first 3D modeling tool during my Sophomore year in college using C++, X11 Motif and Sun hardware. Recently I discovered POV-Ray, an open source ray-tracing program that uses a simple Scene Description Language to model primitives. 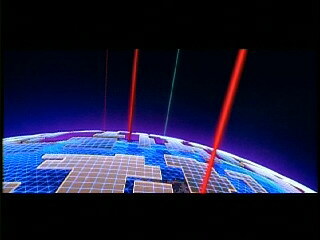 Naturally, this fits well with the models in TRON so I spent a few hours render various TRON-world objects. The following is a lineup of light cycles. The model for the Light Cycle, using only primitives, is based on work done by Carl N. Hoff. I used the iteration aspects of POV-Ray to produce a test animation sequence, and hopefully, a short film. The following is the first scene in my “Spectrum Run” short idea. In this sequence, I experimented with transparency, lighting, and an orbiting camera perspective. I then played around with motion. In the following sequence, I propel the white Light Cycle toward a digital prism. Upon contact with this prism, the Light Cycle will refract into a spectrum of Light Cycles that begin a quest to color their once monochromatic world with user creativity. It needs work. The transition is missing an expected inertia. A pull away, birds-eye-view might help tell the story.